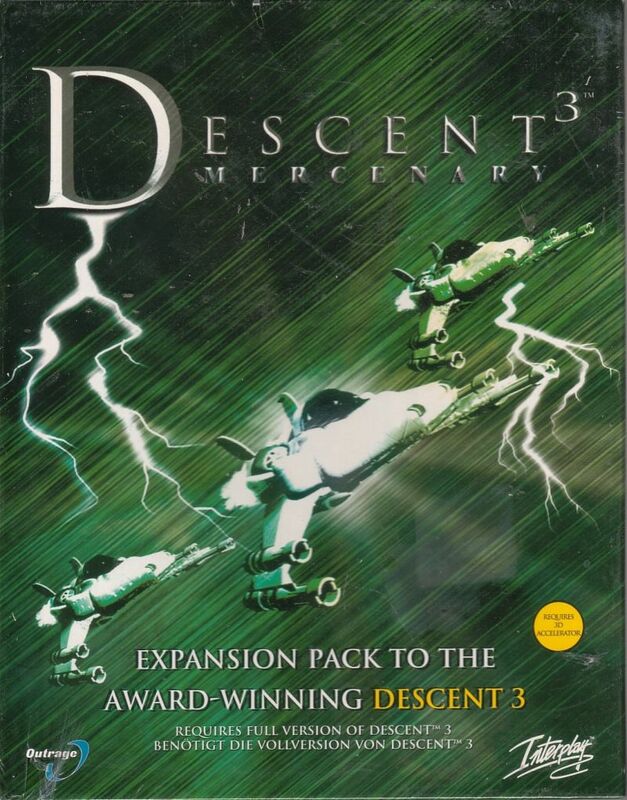 The Mercenary expansion for Descent 3: Retribution is probably good enough to inherit the main game's underdog status. It comes with seven new missions, lots of multiplayer maps, new enemy types and a new ship with some special properties. While it's not exactly a waste of time and does whack some new ideas on the table, you will see that it doesn't quite match the base game in production values. There's a bit of a story, though the intro doesn't really make much sense and the end cutscene is comically frugal, especially by contrast with the one you got in Retribution. The gist is you're now another hapless pilot drawn into PTMC's heinous service. There's a lot more text during briefings in the expansion, and more guidebot prompts to fill in for any new voice-acting. Several of the missions have a length more like Doom than what you're accustomed to coming from the base campaign. A few have decent length, however, and it seems there's somewhat more scripted events and other gimmicky stuff in general. The third mission is probably the best of the bunch, akin to the base campaign's ginormous Dreadnought that was my favorite at least. The fourth one goes far left-field in its conceptual design but I felt didn't live up to its own hype. It was also a bit confusing. As for the rest of the levels, there's one where you get to smuggle some crates into a facility and then actually enjoy having powerful allies on your side for the short, sweet time it lasts. There's another one where you have to hide from turrets (much more fun than trying to fight them all, I assure you! ), and one that's completely infested with a new kind of trooper that has a mass driver. The same kind you have. Yes, the sniper troopers... Love them or loathe them, I'd like to say they define the expansion's gameplay more so than any other new addition. On Ace or above, their accuracy would probably earn them a quick VAC ban if they went to play CS:GO on any public servers. There are broadly two ways to counter them but one is kind of sluggish and the other involves putting yourself at risk in case they weren't alone. The third one is obvious enough: homing missiles. A ton of them. They're just tough enough so you'll work through an unsustainable chunk of your stock, but not so tough as to warrant going "MMbop" over their asses (hint: the Big Red). Honestly, they could have used some rebalancing in more than one way. They even blow up in a shower of scrap, reminding you of those infamous Scarabs in Diablo II. Aside from the snipers, there's turrets. Lots of them. A lot of them fire basically-impossible-to-dodge flak at you so you just have to fight them indirectly (meaning setting up an angle at which one of your lasers just about clips them without giving them an angle back, that or spending another ton of homers). A bit of a pain to fight, the turrets, unless they're by themselves in which case you might be able to just circle around them at no peril. The visuals don't really have any improvements in them, except some enemies have a kind of motion blur as they zoom about. The epilepsy warning from the main game still stands, with no way to disable the flashing in the (thankfully) few places where it was used. The music is still of the old quality, still by Jerry Berlongieri. As for QA, there's a few places where the gaps are too tight to comfortably fit through and sometimes it seems enemies can shoot through walls. Nothing too major though. All in all, a non-revolutionary expansion that still sports sufficient novelty to play through once. Two thumbs up! You have to play the expansion through to Mission 3 in order to unlock the new ship, the Black Pyro. You should try every weapon on the new ship, even if you'd dismissed them before, since some of them have slightly altered fire modes. There's a crash in Mission 5 that happens around the room after the part where the lasers blast a hole in the ceiling (you won't miss it). The best way to deal with it might be to avoid alerting the turret outside the door until you're ready to move on. Just don't stick around and it should be fine. Possibly destroying the turret also works. Thread on the GOG forums. 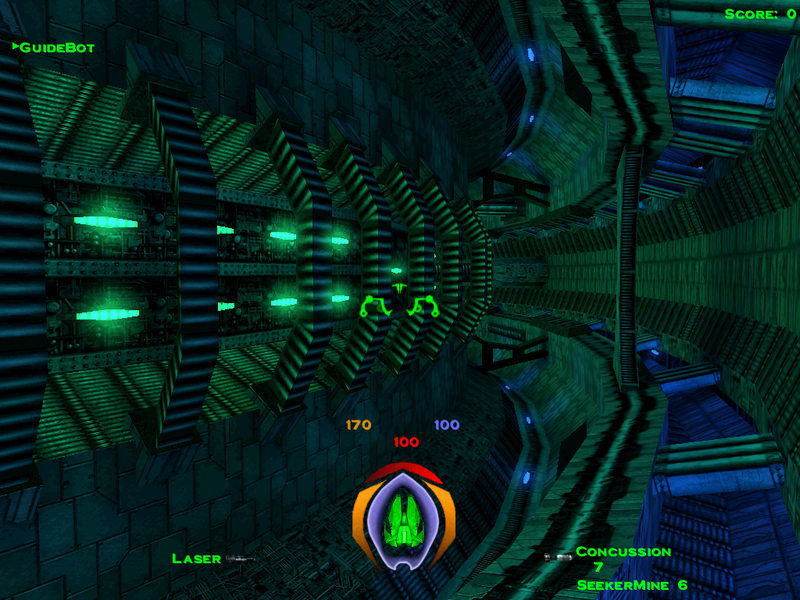 In Mission 7, there's these random bright beacon-type things near turrets that you can destroy. Targeting them first makes it possible to avoid a lot of the repetitive fighting. If you're still stuck anywhere, try the Descendarium for helpful guides to this and the base game. Link below.